I think Bobby Sands is smiling. In 1981, Bobby was an Irish prisoner in a British jail. As a member of the Irish Republican Army (IRA), he led a hunger strike for political prisoner status, an action that ended in death for him and nine of his comrades. As each martyr perished, from Bobby’s death on May 5, to August of that year, Hartford supporters held a memorial mass at St. Peter’s Church on South Green. 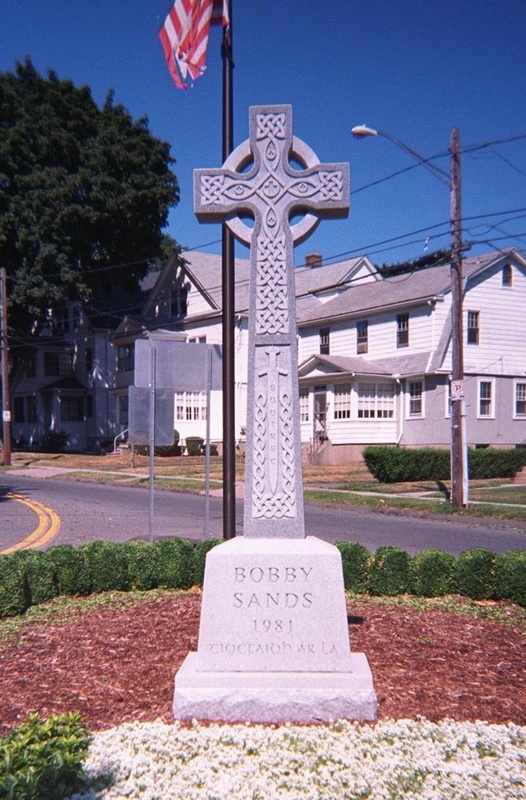 Today, this country’s only permanent memorial to these ten martyrs is a Celtic cross that resides at Bobby Sands Circle across from Hartford’s Goodwin Park. Nine years before the hunger strike, the Northern Ireland Civil Rights Association had been attacked in Derry by British paratroopers. 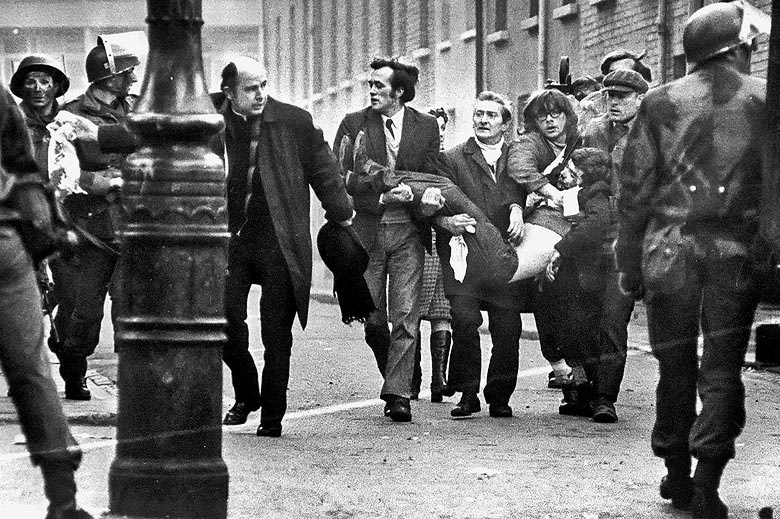 January 30, 1972– Bloody Sunday– was an unprovoked massacre. Again, Hartford supporters of Irish freedom responded. So what’s to smile about? The IRA’s historic August 31, 1994 cessation of military operations, and the July 28, 2005 announcement to end the war against the British occupation of Ireland’s north. These events marked significant steps toward the goal of one united republic, north and south. It is part of a century’s quest for the equality of all the people on that troubled island. 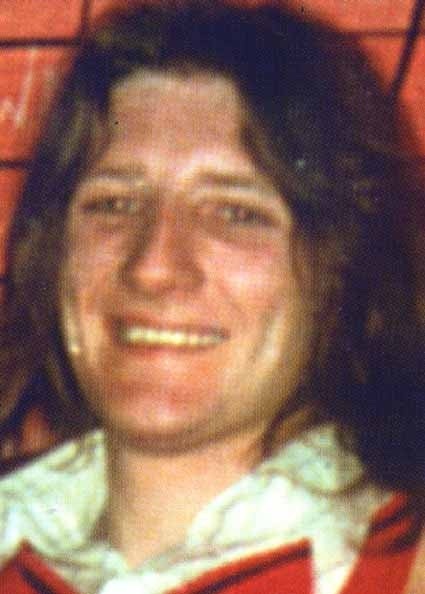 Bobby Sands may be the best example of the complicated path that the Irish republican movement has taken, a strategy that has balanced armed struggle and electoral engagement. While on the prison hunger strike, Bobby ran for and won a seat in the British Parliament, a position he never took. 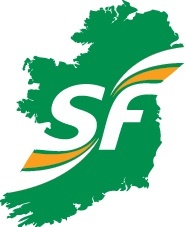 Since that time, his party Sinn Fein, the political arm of the republican movement, has grown into the largest political party operating at every level in Ireland, winning seats in the British Parliament, the European Parliament, the northern Assembly and the Irish Dail Eireann (parliament) as well as many local and county seats. Sinn Fein has become a threat to the political status quo the same way the IRA threatened British military rule. The fight for Irish freedom has been supported by Hartford people for more than a hundred years, since the first Irish immigrants to this city donated their first dollars to the Patrick Pearse branch of the Friends of Irish Freedom. When Eamon de Valera came to Hartford in 1920, he was hailed as a hero even though he was a fugitive who had escaped from a British prison some months earlier. De Valera was welcomed by the mayor and city council and treated to a parade at the state Capitol. He later became the first president of the 26 counties of the Irish Republic. Our city also hosted Michael Davitt of the Land League, and Mary MacSwiney, widow of the mayor of Dublin who perished while on hunger strike in a British jail. And in 1902, James Connolly, patriot, martyr, and IWW organizer addressed an enthusiastic crowd on the subject of Home Rule and Socialism. Similarly, Connecticut support has been accorded modern-day republicans from Joe Cahill to Martin McGuinness and Gerry Adams. When Adams was granted a U.S. visa for the first time in 1994, Connecticut politicians scrambled to the stage and posed alongside him in front of a massive crowd in Glastonbury, Connecticut. On May 30, 1998, Adams was in Hartford for the national convention of Irish Northern Aid (Noraid). In August, 2013, Sinn Fein member Senator David Cullinane joined Noraid at the Hunger Strikers Memorial. These tours and speeches have always been sponsored by local Irish Americans of Noraid, an area support group that for 40 years has undertaken the republican cause in the face of indifference or hostility. I am no expert on the Irish political scene, but I have stood with Belfast mothers whose sons were killed by “non-lethal” plastic bullets fired by police. I have picketed at the British Embassy in Dublin with members of Ogra Shinn Fein, the party’s vibrant youth wing. I have marched the route in Derry that took peaceful protestors to their deaths at the hands of British paratroopers in 1972. I’ve stood on the spot in Kilmainham jail where union leader and revolutionary James Connolly was strapped to a chair– because his wounds made it impossible to stand– and executed in 1916 by the British army. 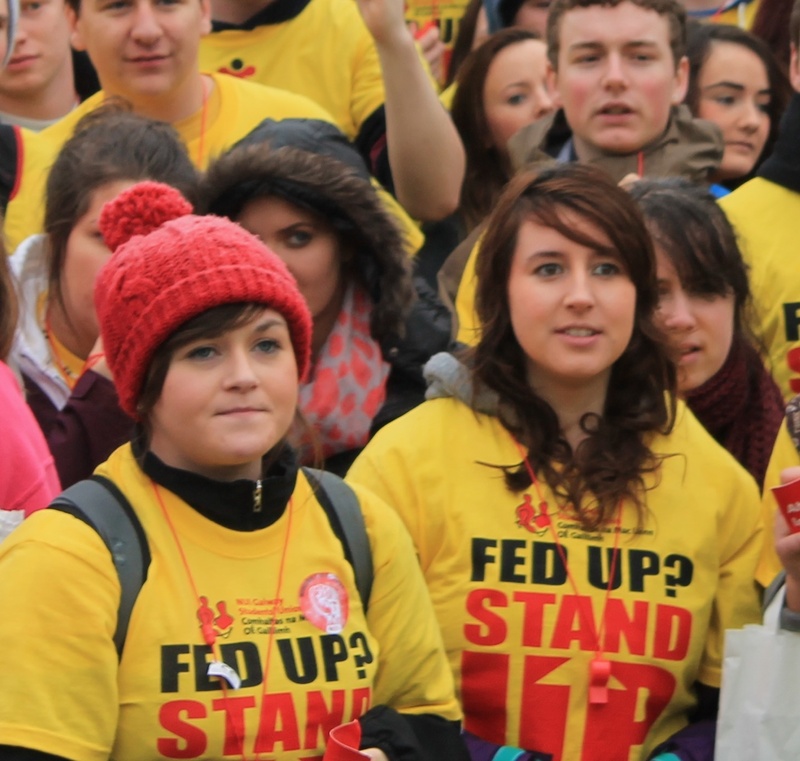 Young Irish women protest austerity. But my most important education has come from the ordinary working people who have spent their lives supporting the Irish republican movement: the thread mill worker, the cook, the construction worker, all of whom made me welcome in their homes. They taught me that the truth behind “the Troubles” is not about religion but really a fight for self-determination and first-class citizenship. I also attended 2005’s Sinn Fein convention in Dublin, which commemorated the centennial of the party’s birth. I was struck by the matter-of-fact business to which the delegates attended, from a debate over affirmative action to the creation of programs for unemployed youth. I realized that the aspirations of the Irish people are unstoppable, despite mistakes and setbacks. Most troubling to potential American supporters has been the violence that has cost lives on all sides. All civilized people condemn the carnage caused by bombs and guns. But as Americans, we are schizophrenic about violence when it comes to causes we see as just. 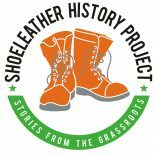 Was John Brown a madman or a hero? It depends on which side of the slavery debate you were on. Do we see Nelson Mandela as a liberator or a terrorist? As history progresses, the Irish republican movement will undergo the same scrutiny that the abolition and anti-apartheid movements have faced, and it will be acknowledged as the historic anti-colonial freedom movement that it is. The IRA’s decision to completely end its armed campaign and engage in purely political work has held, despite the critics’ apocalyptic forecasts. 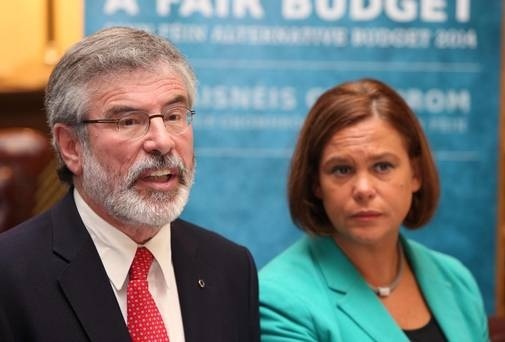 Sinn Fein has grown on both sides of the border and continues to organize toward inevitable unification. Planning to view the monument next week. Great essay. Thank you. This entry was posted on January 6, 2014 by Steve Thornton in Hartford.